'Supernatural' The Superwax, Plain & Simple. If you wanted to try the super-premium Supernatural wax before diving into a full sized tub, then the Mini Jar is the perfect introduction. The durability of a sealant with the shine of a true carnauba, the Hybrid gives customers the best of both worlds. The buttery texture means it's easy to use and will even help to fill minor imperfections in paintwork, leaving a glossy, smooth finish. Supernatural contains an enhanced amount of No.1 grade carnauba wax for maximum shine effect! Typically a layer of Supernatural Hybrid will last 4-6 months even during harsh road conditions experienced during winter. What's more, the durability also makes it great for wheels too! 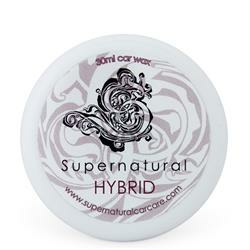 As with all the products in the Supernatural range, the Hybrid Paste Wax/Sealant Mini Jar has no added colourings or fragrances making it as pure and effective as possible.